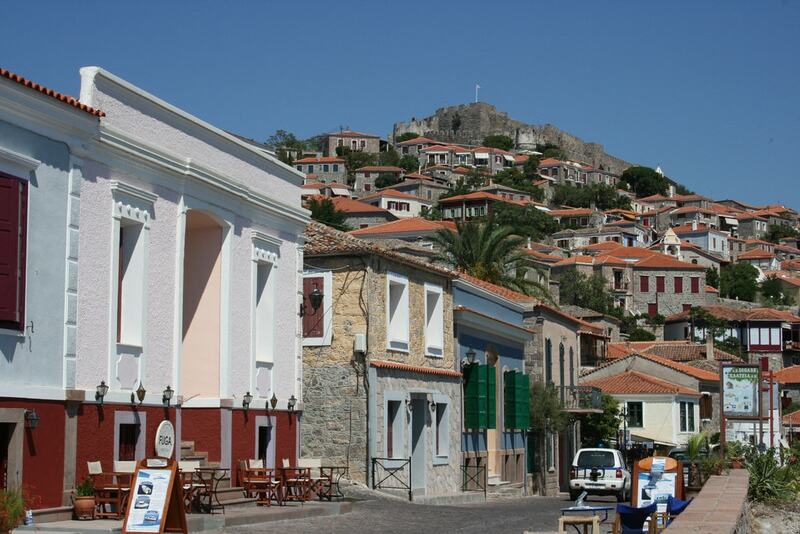 Greece has a few hidden gems besides its splendid islands and perennial monuments, and one of them is the villages. Hidden across the territory, they have something unique and special where it seems time came to a standstill. Whether it is their architecture, historical aspect or simply their tranquil vibe, villages in Greece are definitely worth a visit. Here are some of the prettiest untouched villages you should head to. The Prespa lakes region is a vast natural park shared by Greece, Albania and FYROM, which is blessed with a rich biodiversity. While there are two lakes Megali (Great) and Mikri (Small) Prespa, the region is dotted with small villages and hamlets. One particular village worth discovering is Agios Germanos. Hidden at 1,100 meters high and seven kilometers from the lakes, it is a beautiful village of stone houses that has preserved its authentic character. Featuring a few Byzantine-style churches built in the 11th and 18th-century, Agios Germanos is bordered by a tranquil forested area where you can enjoy rejuvenating hikes. Don’t forget to stop by the local tavernas surrounding the small square where you sample flavorful fare prepared with locally grown ingredients. Make sure to explore the little islet of Agios Achilleos, take a stroll around the little hamlet of Psarades or have a delicious dinner at Mikrilimni’s best kitchen. Epirus, one of the most underrated regions of Greece, is home to a collection of 40-something villages called Zagohoria, on the Pindus mountains. Revel in the unparalleled beauty of the region with its striking beauty and ecosystemic diversity. From larger villages to peaceful hamlets, you will be able to stay in picturesque guesthouses and explore the region and its national park. We suspect you will leave refreshed and relaxed. If you are looking for an unspoiled place, Vatheia is definitely the go-to place. 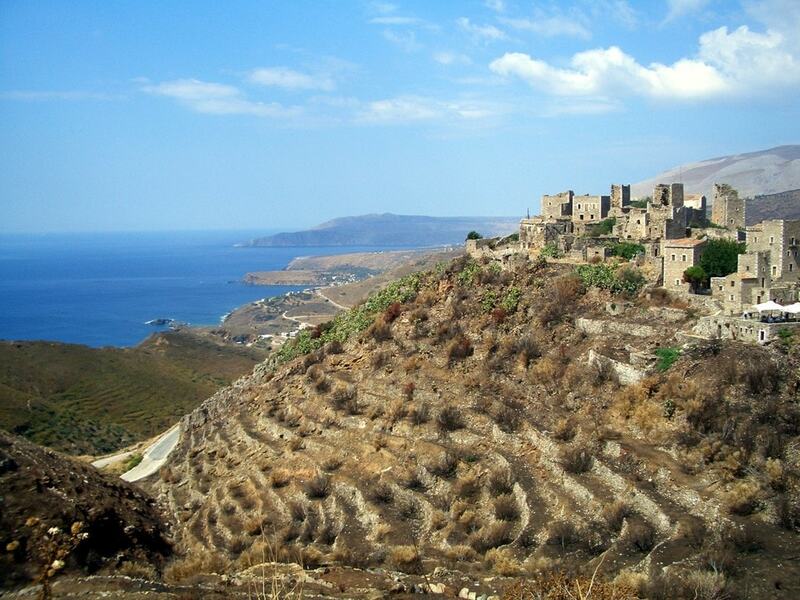 Located on the Mani peninsula, in Peloponnese, it is a small little settlement lost in the mountains. With traditional tower houses, typical of the region, Vatheia is a characteristic place on the verge of becoming a ghost town as it has been suffering from a severe rural exodus in the past decades. Now with only a dozen permanent residents, the village gets a mystical and haunted vibe, which makes it an interesting place to explore. Roam freely among the abandoned houses and try to imagine the village during its glorious days. And let’s hope that the little village will soon be reborn. Featuring in “The 10 most beautiful villages of Europe” list, Nymfaio is a stunning village on Mount Vitsi (also Vernon), in Florina. A little gem of cobblestone streets and stone houses, Nymfaio is a favorite winter destination for Greeks but unknown to foreigners. Time to rectify this and revel in the beauty of the surroundings. And if you are scared of getting bored at some point, don’t worry, the nearby wineries of the Florina region are a perfect excuse to scout the area. The little port town of Fiskardo, on the northern side of Kefalonia, is a too-often-forgotten destination in the Ionian island. 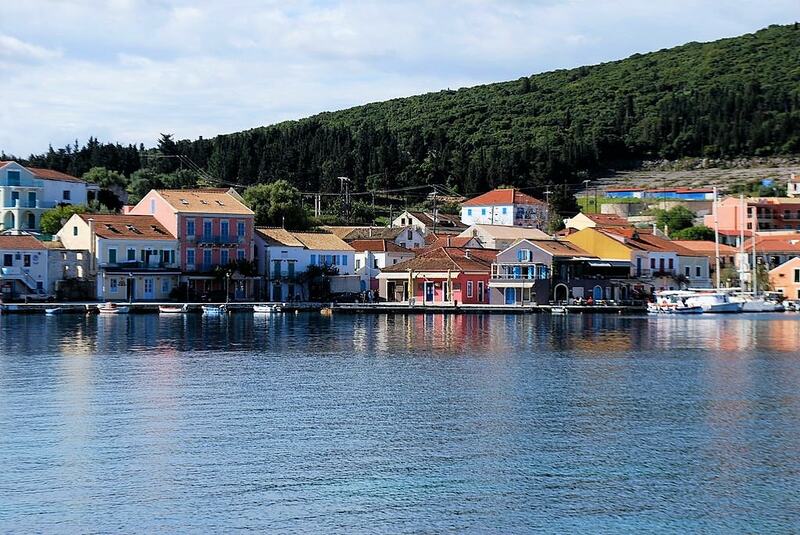 Connected to the neighboring islands of Ithaki and Lefkada, Fiskardo has a charming promenade bordered by fish tavernas, cafés and restaurants where you can enjoy local cuisine and freshly-caught seafood. Perfect to combine with an afternoon of swimming, Fiskardo is conveniently located near picturesque coves ideal for diving and swimming. Dubbed the “Balcony of Pelion” thanks to its location 600 meters above sea level, Makrinitsa is a scenic village with exceptional architectural features, preserved stone houses and narrow streets and more than 60 traditional fountains. Surrounded by lush greenery, it has a cute main square which offers spectacular views over the sea and the city of Volos. For hiking fans, the nearby forests hide old churches and deserted settlements. A real treat for those looking for active holidays. 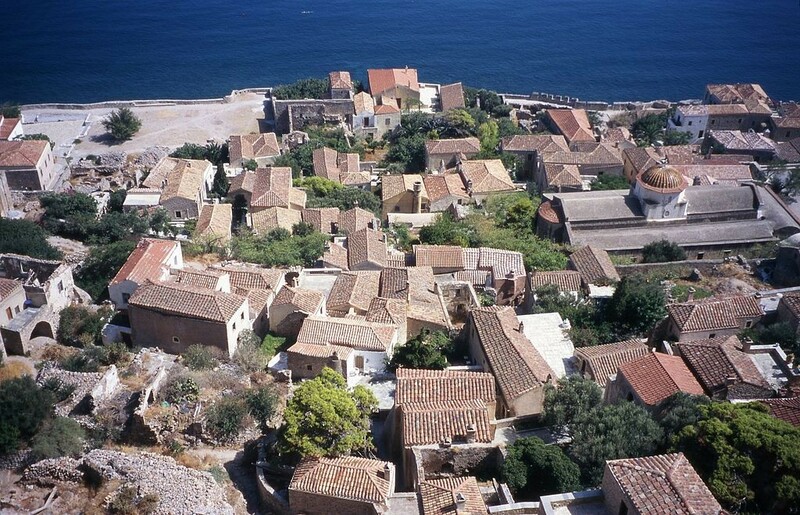 The spectacular fortified town of Monemvasia is connected to the mainland via a causeway. But the highlight of this medieval gem is that is has retained its traditional architecture and once you climb to the church at the top, you get spectacular views over the shiny blue sea. You will certainly enjoy strolling around the cobble streets while admiring the little houses with bougainvillea-covered walls. If you can, stay in the old town to make your trip even more romantic. The Mastihohoria (or Mastiha villages) is a group of medieval villages located in the south of the island of Chios, known for the cultivation of mastic, or mastiha, a resin once considered like the island’s own gold. Despite the centuries, these villages have maintained their architecture and traditions and as such, are the perfect destination if you happen to visit the island. Fun fact – the labyrinth-like street layout of the Mastihohoria was made to confuse intruders, who often tried to control the region’s lucrative livelihood. 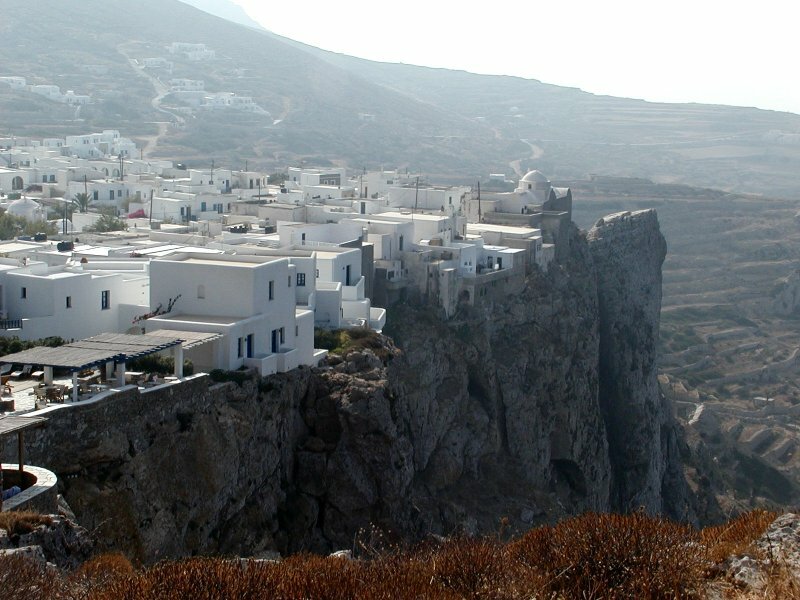 Off the beaten path Folegandros is home to a beautiful hora, perched on the edge of a cliff, standing at 200 meters above the sea. Offering panoramic views over the Aegean Sea, the main town, though more similar to a small village, is just like any Cycladic island and boasts sun-bleached houses, with colorful wooden doors and windows. Make your way up to the Kastro, the castle, and take the time to admire the beautiful churches you will encounter along the way. Molyvos (or Mithimna) is an enchanting village in Lesvos, or Mytilini. Though it is quite popular among Greeks, Molyvos is virtually unknown to visitors from abroad. This traditional settlement is located on the northern part of the island and is particularly enthralling with its stone and wood houses, small streets and alleys. Make the time to visit the castle perched on top of the hill (don’t forget to enjoy the view) but be sure to stop by the promenade by the harbor. Find a cozy spot and order some ouzo as well as a few mezes to pair it with. Welcome to paradise.